Our ability to become, or remain, relevant comes down to an ability to adapt. To adapt means to learn and an ability to learn is an organization’s top priority in the final frontier of competitive advantage. The value of training becomes an organization advantage. Any item that can not show direct business impact finds their way onto an organization’s chopping block. 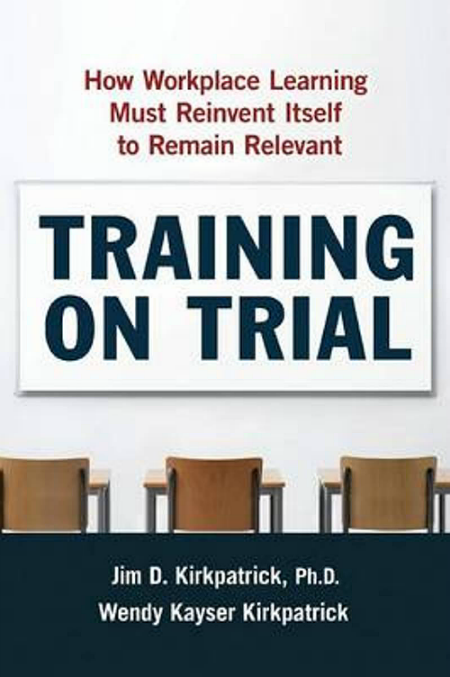 The strategic ability to train and to educate and the value of training on trial. Every dollar invested in training is a dollar taken from elsewhere. And the business project portfolio has an expected return. The need for training to produce an ROI means our concept of ROI needs to include both Return on Involvement as well as Return on Investment. The best evaluator I have come across to marry training to business results, which means the measure of results, is the Kirkpatrick Model. Any trainer or training designer worth their salt has to know about the Kirkpatrick Model to evaluate, demonstrated, training business partnership. 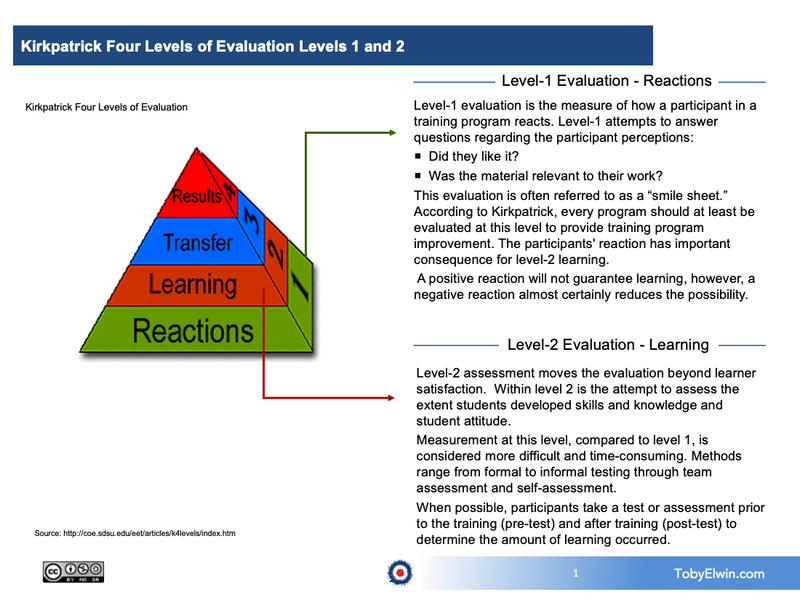 Level 1: Reaction — To what degree participants react favorably to the training. Level 2: Learning — To what degree participants acquire the intended knowledge, skills, attitudes, confidence, and commitment based on their participation in a training event. Level 3: Behavior — To what degree participants apply what they learned during training when they are back on the job. 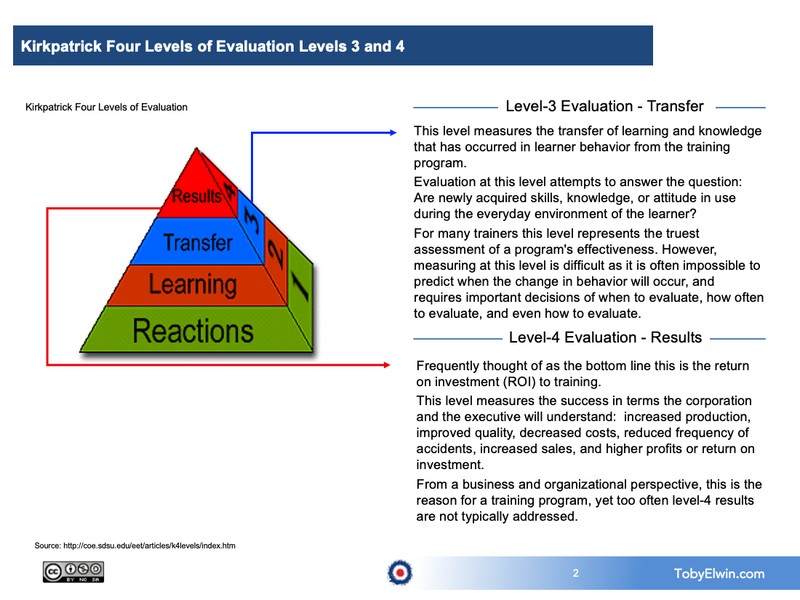 Level 4: Results — To what degree targeted outcomes occur as a result of the training event and subsequent reinforcement. Important each level below builds ability to meet the next. You can not jump to Level 4: Results without accomplishing Levels 1: Reaction through Level 3: Behavior to note that you need to build Level 1, then 2, then 3, to get to Level 4. Build training as a business advantage when the present value yields future results. The top down view is judge and jury, your organization executives. The devil is in the details of when planning, strategic or tactical linking goals, objectives, and actions includes starting with the view from the top in your planning. Make an executives job easier to support training when you speak their language. Start at Level 4 and move down the levels to provide strategic linkage to enable those business results — always a wise decision. The chain of evidence can not break. Meaning you can not go from Level 1 to Level 2 and up to Level 4, or the opposite. Each relies on the former for credibility. Every hour of time invested in one endeavor is an hour of time lost to another endeavor. As a business owner this use of resource should provide a return. An hour invested is never recouped, so invest wisely. Every dollar invested in one endeavor is a dollar lost to another endeavor. As a business owner this use of resource should provide a return on investment (ROI); must provide return on investment. The model has moved from strictly training into complete acceptance and advocacy to manage and coordinate organization change and to value the all learning functions. Starting at Level 4 also allows deep-seated, business logic when tie business goals to behavior change. Organization commitment is the critical essence to behavior change any executive would welcome. Now, let’s talk about how to hold your training vendors accountable. Just because they call themselves a training vendor does not mean they provide Level 4 training for your organization’s needs. One quick proxy for a vendor’s ability to meet this: if you bring up Kirkpatrick, just the word ‘Kirkpatrick’, and get a blank stare, from anyone involved in training, order your coffee ‘to go’ and erase the meeting from your smart phone. So, if Don Kirkpatrick is the Father of Four Levels, this books is by the son of the four levels and the daughter-in-law of the four levels. Their view continues provides newer application of the Kirkpatrick Four-Level Evaluation Model along with tips and techniques for action. So, again, invest wisely and training will move from a stay of execution, out of the courtroom, and into the executive suite.